Unlike the strong first two quarters of the year, the vacancy rate for this 3rd quarter in Miami-Dade County’s industrial real estate market actually increased slightly to 7.2%. This is partly due to the new construction of warehouses that are now being delivered onto the market. Another factor for the negative absorption this quarter is that some businesses truly seem to be on hold until the U.S. presidential election is decided; right or left. Our future president could impact commercial real estate and the businesses within via increased capital gains taxes, costs for employees, federal regulations and more. A survey conducted by the Florida Association of Realtors states that about 25% of active buyers will not make their purchase until after the election. The average industrial gross lease rates remain the same at $7.42 per sq. ft. There were two major lease transactions including Perez Trading’s new space of 280,000 sq. ft. and Ameriworld Enterprises’ relocation into a 124,000 sq. ft. space. 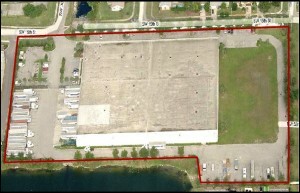 There is some good news to help empty warehouse spaces in Miami fill up some more. According to Miami-Dade County’s latest International Trade Report, both exports and imports increased slightly to about $14B and $10B (respectively) over the past quarter. 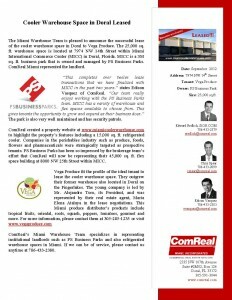 On October 2nd, ComReal Miami hosted a free workshop on foreign trade zones (FTZ’s). Arcelio Gerardo of FTZ World Services and Jorge Suarez of Cargo Ventures conducted the workshop at the Miami Free Zone. About thirty people attended. Most of them were in logistics and/or freight forwarding. We plan to have another FTZ workshop in February. Please let us know if you would be interested in attending so that we can be sure to send you an invitation.